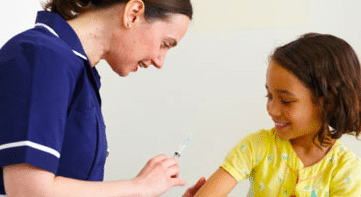 The administration of the MMR vaccine to egg-allergic children has an excellent safety record and should be given to all egg-allergic children as a routine procedure in primary care, unless there is a history of previous reaction to the vaccine. The traces of egg protein found in MMR vaccine are too small to represent a risk. All children at risk of serious influenza infection should receive an influenza vaccine. In addition, the extended programme of influenza immunisation for children will involve all 2-4 year old children as well as those in school years 1-5. This information is summarised on the DOH webpages and can be reached by searching for ‘which flu vaccine should children have? Copyright © 2019 North West Allergy Network. All rights reserved.